Multiword expressions: hard going or plain sailing? 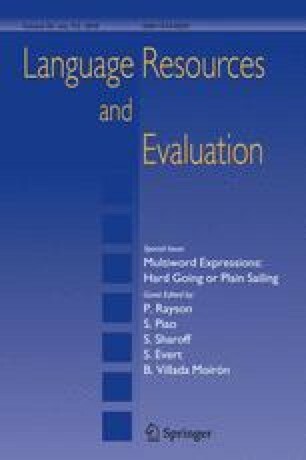 Over the past two decades or so, Multi-Word Expressions (MWEs; also called Multi-word Units) have been an increasingly important concern for Computational Linguistics and Natural Language Processing (NLP). The term MWE has been used to refer to various types of linguistic units and expressions, including idioms, noun compounds, phrasal verbs, light verbs and other habitual collocations. However, while there is no universally agreed definition for MWE as yet, most researchers use the term to refer to those frequently occurring phrasal units which are subject to certain level of semantic opaqueness, or non-compositionality. Non-compositional MWEs pose tough challenges for automatic analysis because their interpretation cannot be achieved by directly combining the semantics of their constituents, thereby causing the “pain in the neck of NLP” (Sag et al. 2001).